A gluten-free white sauce can make your everyday meal more of a culinary adventure with careful planning and a little tweaking. Going gluten-free, after all, does not mean giving up taste. 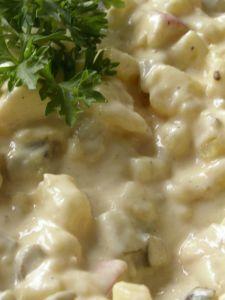 The white sauce or béchamel is one of the most basic and versatile of recipes. It is one of the essentials whether you are cooking gluten-free foods or not. The basic recipe is a good foundation for other variations. You can use this recipe to make a quick meal, using ingredients you probably have on hand at all times. To make the sauce, begin by melting the butter in a heavy saucepan. Add the milk in a steady stream, stirring constantly with a whisk to avoid lumps. Add the cornstarch. Heat the sauce until hot, but not boiling to avoid breaking down the butter. Season your sauce to taste. That's it!You can also melt the butter on its own with 1 ½ cups of milk and seasonings. You can then make a roux with the remaining milk and the cornstarch. Some people may find this an easier variation which is less prone to lumps. For a more elegant presentation, use white pepper instead of black pepper. The basic recipe is just the beginning. Now you can have some fun with the sauce and make your own variations. You can create your own homemade macaroni and cheese by adding shredded cheese to the basic sauce recipe. Make sure and stir the sauce well to completely melt the cheese. You can use cheddar, Colby, Swiss or whatever combinations of cheeses for your own unique take on this classic comfort food. The key to making the gluten-free sauce is the thickening agent. Rather than using flour, cornstarch provides a gluten-free alternative. You may also find cornstarch handles much easier in your cooking than flour. It does not flavor the food, nor is it prone to lumps as is the case with using flour. You won't need to strain your sauce before using it, making it a better alternative to the conventional recipe. The white sauce recipe shows how the gluten-free kitchen does not give up flavor with the gluten. You can eat in style with an endless selection of recipes which are delicious and easy to prepare. Whether you are cooking for yourself or the entire family, this sauce gives you the foundation for many tasty meals.